TrackMySubs enables users to track spending month to month, and assess how much budget is left to spend for the remainder of the current month. Users can create folders to group payments, and also see it all in a calendar view. Clever filters also allow users to filter their view by folder or payment type to quickly identify the details they are looking for. TrackMySubs is one of my favorite apps and I use it all the time to track all my recurring payments. Helps me budget, keep track of every subscription and recurring payment both personally and in my online business. I've noticed that so many services are subscription based these days and to be honest I actually prefer subscriptions because it's incentive for companies to provide a good service and keep their service or product up to date.I like that at a glance I can see how much money I am spending on every subscription and every recurring payment I have. Before I used this tool I would waste so much money subscribing to stuff which I then forgot to cancel, things like insurances which I used to set and forget are now front of mind and lets me easily find better deals without having to dig through paperwork. I've got it set up so that an alert gets emailed to me so I know ahead of time before I'm going to get hit with any payment. TMS listens to feedback and regularly includes useful features. When I first signed up I thought it'd be a gimmick because I could only think of about 5-10 subscriptions or recurring payments and for that amount it wouldn't be worth it. But as it turns out I have almost 50! I got on a roll and went through my bank statements and ended up entering all my recurring payments. So now I have everything logged now like mortgage, loans, utility bills, insurance, rates, netflix, rego, apple music, icloud data storage, bank fees, phone, office365, and a whole stack more. I don't usually recommend software - probably like most people because the motivation is more for complaining about apps that don't work like they're supposed to rather than recommending the ones that do. But the fact that this app paid for itself about 5x over in the first month has made it one of the two or three apps I always recommend. It's saved (and continues to save) me cash. I like that at a glance I can see how much money I am spending on every subscription and every recurring payment I have. Before I used this tool I would waste so much money subscribing to stuff which I then forgot to cancel, things like insurances which I used to set and forget are now front of mind and lets me easily find better deals without having to dig through paperwork. I've got it set up so that an alert gets emailed to me so I know ahead of time before I'm going to get hit with any payment. TMS listens to feedback and regularly includes useful features. When I first signed up I thought it'd be a gimmick because I could only think of about 5-10 subscriptions or recurring payments and for that amount it wouldn't be worth it. But as it turns out I have almost 50! I got on a roll and went through my bank statements and ended up entering all my recurring payments. So now I have everything logged now like mortgage, loans, utility bills, insurance, rates, netflix, rego, apple music, icloud data storage, bank fees, phone, office365, and a whole stack more. I don't usually recommend software - probably like most people because the motivation is more for complaining about apps that don't work like they're supposed to rather than recommending the ones that do. But the fact that this app paid for itself about 5x over in the first month has made it one of the two or three apps I always recommend. It's saved (and continues to save) me cash. I can't really think of anything bad about this software - other than I wish I'd had it for the past 20 years, rather than just the last year! Probably the only negative is that they don't have an affiliate or credit system set up because I've probably recommended about 10 people to TMS in the past year already! But seriously, it's no big deal. It costs barely more than a coffee a month it's pretty much a no brainer buy. I love this software! 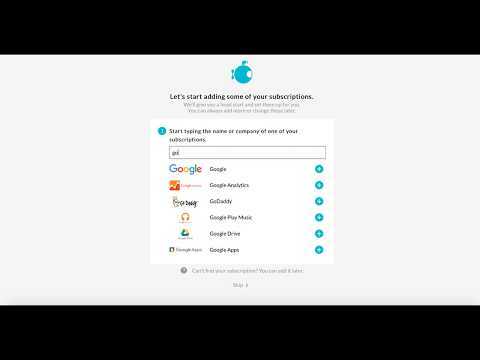 Easy to use and effective at managing subscriptions! It helps me keep track of my subscriptions, cancel before they charge again when I'm not renewing and overall manage my cash flow. I feel a lot more in control of my subscription payments and am no longer surprised by charges I didn't expect showing up on my credit card.TrackmySubs is easy to use, effective, and (dare I say?) fun! It's easy to get started and now, anytime I add a subscription payment, it's part of my workflow to add the details into TrackmySubs right away. Although it seems like I could keep track of my subscriptions using an Excel file or something else like that, the truth is that I never did that- and anyway, I didn't set up Excel to email me automatically and update me when a subscription was about to go through again. I've been using TrackmySubs for a few months, but it has already saved me money, enabling me to cancel subscriptions I didn't want to renew- and even more than that, it's helped me keep track of mysterious payments that go out of my Paypal account with a preapproval key and no other information. This will come in handy next year when many of these renew and I have no memory of what the the purchase was. I don't promote many software programs, but I am a proud affiliate for TrackmySubs. I recommend it to any online business owner who wants to keep better track of their subscriptions and manage their cash flow. TrackmySubs is easy to use, effective, and (dare I say?) fun! It's easy to get started and now, anytime I add a subscription payment, it's part of my workflow to add the details into TrackmySubs right away. Although it seems like I could keep track of my subscriptions using an Excel file or something else like that, the truth is that I never did that- and anyway, I didn't set up Excel to email me automatically and update me when a subscription was about to go through again. I've been using TrackmySubs for a few months, but it has already saved me money, enabling me to cancel subscriptions I didn't want to renew- and even more than that, it's helped me keep track of mysterious payments that go out of my Paypal account with a preapproval key and no other information. This will come in handy next year when many of these renew and I have no memory of what the the purchase was. I don't promote many software programs, but I am a proud affiliate for TrackmySubs. I recommend it to any online business owner who wants to keep better track of their subscriptions and manage their cash flow. There is little that I don't like about the software. I think that the set up of non-monthly subscriptions could be slightly more intuitive- i.e. when you set up a subscription that renews every 6 months, it's not immediately clear how to do that. It's possible- and easy to do once you know how, but that was the only slight faltering I had in using the software from the start. Lovely UI! Made me think about my business expenses. Underused as a few holes in meaningful reports. Better understanding of regular business expenses. Quick snapshot of subscriptions and monthly cashflow outgoings.Made/makes me think about my/our expenses as a small business. The UI is awesome, nice work! Having the logos in there means you can get a quick snapshot where things are at. Th email reminders also are a great feature to build on. Calendar was a good addition, ability to subscribe to a feed down the track maybe? Made/makes me think about my/our expenses as a small business. The UI is awesome, nice work! Having the logos in there means you can get a quick snapshot where things are at. Th email reminders also are a great feature to build on. Calendar was a good addition, ability to subscribe to a feed down the track maybe? Reporting is not meaningful enough without us being able to segment. We are small, this would only apply to our use case, but we have our business expenses and large household (like mortgage). It would be great to be able to get a 'payments left this month' total and graph for just our Business expenses by using the filters in the reports. You can filter your reports by clicking on the folders in the key of each chart. This will turn the data on and off in the reports dynamically for whichever you select. I'd love to know if this is the feature you were after. Feel free to reach out to me if you have any trouble. Overall TrackMySubs alerts my finance department and me of future software payments that are due. Just set a "before date" and you will receive a detailed email. This way we are able to check to see if the software in question is still being actively​ used or not and we can decide​ to cancel, renew, or maybe add users to a specific​ application. Having reports with your spending per month or whatever you so desire to see is hugely​​ beneficial. In one instance we found we had a second​ subscription and were able to reduce cost by cancelling.​ TrackMySubs is without a doubt the easiest way to keep an eye on your software expenses.​ Monthly, quarterly, yearly, you name it. Like always, S..t in is S..t out, so make sure you keep your list up to date. TrackMySubs is without a doubt the easiest way to keep an eye on your software expenses.​ Monthly, quarterly, yearly, you name it. Like always, S..t in is S..t out, so make sure you keep your list up to date. There is not much to dislike about this application. The developer​ , Gabe, is always improving and tweaking the software. I wish I had found it earlier! Track My Subs has saved me loads of money by notifying me when a subscription renewal is coming up. I have saved a lot of money by canceling subscriptions that I otherwise wouldn't have.Track My Subs is really easy to use and does exactly what it claims to. I love that I can tag my subs to group them and also put them in folders. And I really love being able to set multiple custom reminders for upcoming renewals and add notes to those reminders. Track My Subs has saved me loads of money by notifying me when a subscription renewal is coming up. I have saved a lot of money by canceling subscriptions that I otherwise wouldn't have. Track My Subs is really easy to use and does exactly what it claims to. I love that I can tag my subs to group them and also put them in folders. And I really love being able to set multiple custom reminders for upcoming renewals and add notes to those reminders. Track My Subs has saved me loads of money by notifying me when a subscription renewal is coming up. I have saved a lot of money by canceling subscriptions that I otherwise wouldn't have. Entrepreneur: $6/month (billed as $72 yearly) or $7/month (billed monthly). Entrepreneur Unlimited: $8/month (billed as $96 yearly) or $10/month (billed monthly). Keep all of subscriptions and recurring payments in one organised place with search functionality and filters. Never forget another subscription by setting multiple alerts and even send alerts to other people to remind them. Add notes to subscriptions and have the notes sent with alerts so that all added information is available when needed. See a breakdown of spending with TrackMySubs' reports, and dynamically filter views by folder type. Receive monthly reports giving a summary of the previous months spend and next month predictions. Choose the preferred currency and all subscriptions, no matter what currency, are converted to the chosen currency. Below are some frequently asked questions for TrackMySubs. Q. What type of pricing plans does TrackMySubs offer? Q. Who are the typical users of TrackMySubs? Q. What languages does TrackMySubs support? Q. Does TrackMySubs support mobile devices? Q. Does TrackMySubs offer an API? No, TrackMySubs does not have an API available. Q. What other apps does TrackMySubs integrate with? Q. What level of support does TrackMySubs offer?